The most recent film in the long-running Yu-Gi-Oh! franchise has been most surprising to me, primarily because, having watched it, I think that this might be the best outing of the series I have seen. This mainly for three reasons: it doesn’t plug the trading card game too much, the quality of the animation is excellent, and unlike the vast majority of releases from the series, you get a choice of sub or dub. That means among other things that if you watch it in the original Japanese, the characters have all of their original Japanese names. Thus Yugi’s friends Joey Wheeler, Tea Gardner, Tristan Taylor and Duke Devlin become Katsuya Jonouchi, Anzu Mazaki, Hiroto Honda and Ryuji Otogi respectively. However, as the dub will be the version most people will probably be familiar with, as you can only watch the DVD release in English, I’ll stick with the English names in this article. The story follows Yugi and his friends after several months have passed following his final duel with the Pharaoh Atem. During that time he has a bit of a growth spurt, while Mokuba Kiba has suddenly become more dapper, dressing in a suit and tie, but his big brother Seto is still his normal brooding self. Well, as normal as you can get when you have built a space station in the shape of your company logo*, attached to your HQ via a giant lift. Seto is grumpy because he still never got to beat Atem, so he has funded an archaeological dig in Egypt to rediscover the Millennium Puzzle so that he can put it together and make Yugi bring him back. They manage to find the puzzle, but when Seto arrives, he is interrupted by a duellist named Diva, who uses a device called a Quantum Cube to teleport people to other dimensions. Diva and Seto duel, but the duel ends abruptly and Diva manages to steal two pieces of the Puzzle. One piece he keeps to himself, the other to his sister, who, in turn, gives it to Yugi. Diva meanwhile disguises himself and joins Yugi’s school under the name of “Aigami”, becoming friends with Yugi, Joey, Tea, Tristan and Bakura. Aigami however soon reveals his identity, transporting Joey to a dimension from which he has to constantly run to escape from, while sending Bakura to a “lower” dimension as Bakura harmed Aigami’s friends when Bakura was under the influence of the Millennium Ring. Joey manages to escape from his predicament but they can’t find Bakura. 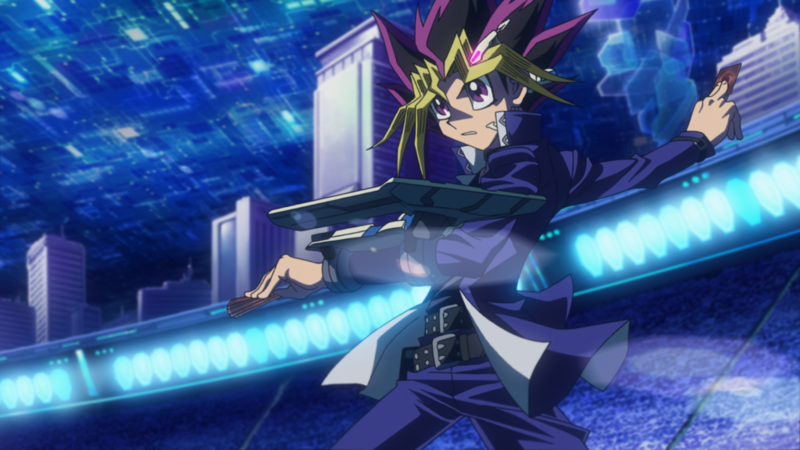 It is not long before Seto appears and challenges Yugi and Diva to a special tournament using the latest “Duel Disc” technology, primarily so that he can get Yugi to resummon Atem. Thus Yugi has to deal with Diva’s schemes, rescuing Bakura, and has to prove to Seto that actually he is a good duellist without the help of Atem. As stated, I think that this film is the best incarnation of the series I have come across. As stated, the game itself doesn’t seem over-plugged. The plot mainly appears to be dealing with the rescue of Bakura, Seto’s driving force to face Atem once again, and Yugi trying to prove that he is good on his own. However, while the plugging isn’t over the top, you do get the feeling it is still there, with things like the Dark Magician being redesigned. 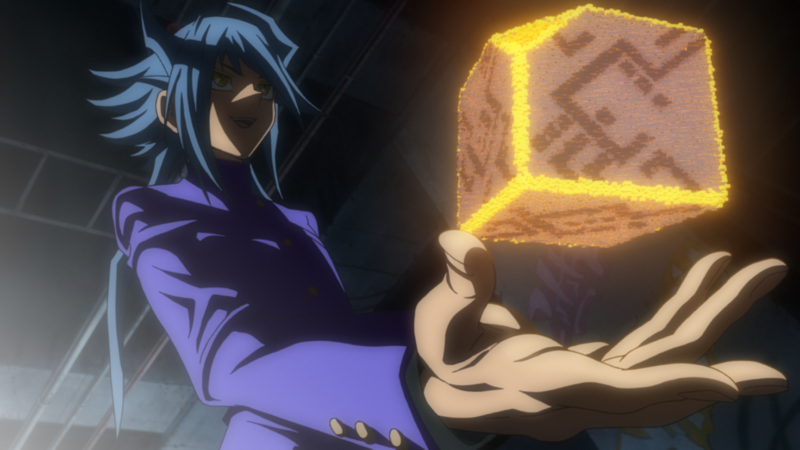 Although, if you listen to the Japanese audio, you can clearly hear Yugi refer to the card as the “Black Magician”. There is also the odd inconsistency. For example, Seto tries to reassemble the Millennium Puzzle using a machine on his space station because of zero gravity – but Seto is unaffected by the weightlessness and is walking and standing in the space station the whole time he is in it. It is also great to be able to hear the original Japanese dub, and the use of the original character names. Of all the voice performances, the one that stands out the most is the role of Seto, performed in Japanese by Kenjiro Tsuda, in a role that I would describe with the worlds “overdramatic echoing”. When he’s duelling, suddenly there’s a loud echo when he announces which incarnation of the Blue Eyes White Dragon he’s using. I wouldn’t say it is better or worse than the English dub, but it is different. At least you don’t really need to worry about dodgy accents like in some of the TV series. 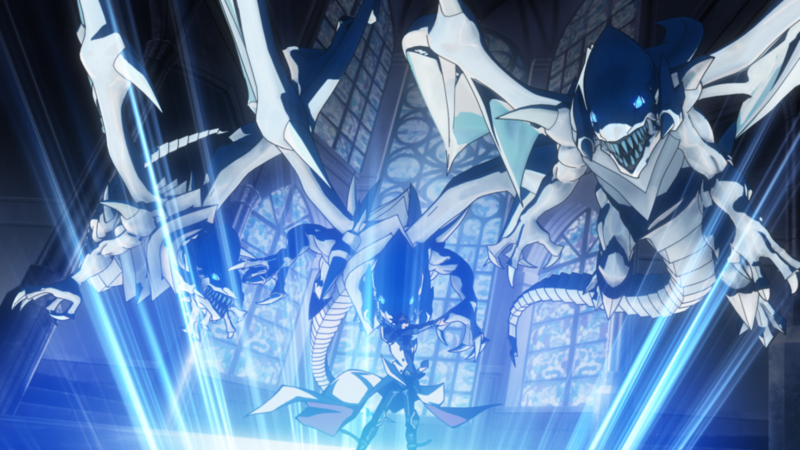 However, best overall is the animation, especially in the duelling scenes. The new duelling discs use some kind of computerized system so the graphic holograms appear more dramatic, and the monsters do look cool. Even the 3D animation, which normally I’m turned off by, looks impressive. Yu-Gi-Oh! is a series that has been constantly swamped by the game it spawned and so many incarnations are just plugging the game, but with the original characters the story has developed so much that they have been able to mature, and it comes across in this film. A worthy watch.